Automate a variety of tasks that simplify information processing and reporting. 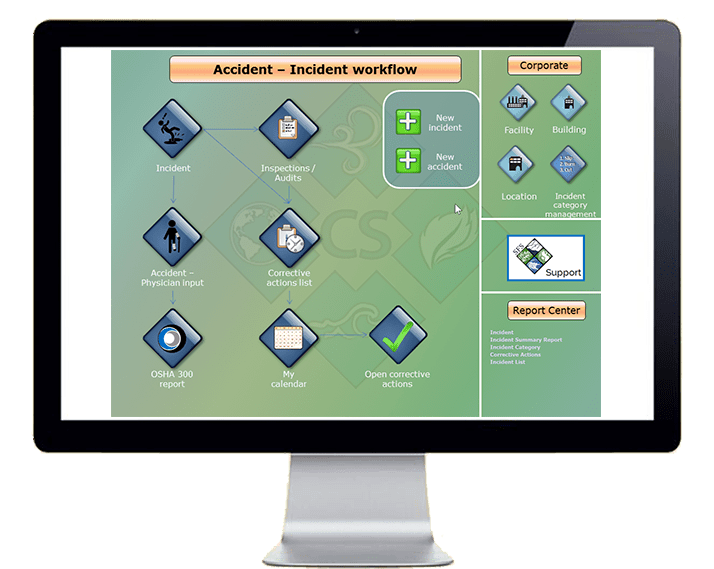 Our facility safety and compliance software module is designed to be the foundation of information collection, monitoring, and reporting. Through this module facilities can identify critical information about their operations, top-down hierarchies can be set up to identify distinct buildings, individual rooms, labs, workstations – and further into sub-levels such as storage cabinets and special-use locations. Connected in real-time with Google Maps, the Facility Module can pinpoint building locations on a map and list chemical container, Safety Data Sheets, waste containers and radioactive materials for emergency response, training and inspection and monitoring of the hazards in the facility. This module can automate a variety of tasks that simplify information processing and reporting. Storage and hazard limits can be set for specific locations and notifications can be automatically sent to the appropriate personnel. The EMS Permit Tracking Module helps personnel record operating permits for their site including dates, associate regulatory agency information, costs, and other details. Source and sample data can be recorded and converted into reports that will compare permit parameters to field data. Documents can be easily scanned in to this module and attached to permit records for a seamless library. This module coupled with the EMS task management tool can be automated to send email reminders for events such as renewal dates, payment notifications, and potential violations. The EMS Industrial Hygiene tool allows personnel to define industrial hygiene monitoring data for specific chemicals, individuals, and locations. This includes defining required test types and methods, establishing targets, and recording test results that can then be reported on. Coupled with the task management module industrial hygiene data can be automated so that email reminders are sent for upcoming test requirements, potential risk related information. The EMS Work Order Module allows facility operation personnel to create work orders as well as assign timelines, personnel, equipment and costs to projects. Here you can attach documents, photos, videos and other useful data to specific locations. As an enterprise level system, EMS has built-in tools that allow administrators to create and manage site-specific configurations of the application. This includes creating automated system settings, assigning group and user access/operation rights, creating User-Defined Fields (UDFs) as needed, and supporting group and user-specific custom functions. The EMS Audit and Inspections Module keeps and inventory of all safety equipment in a location, while this task seems rather simple its utility is immense and the technology impressive. Chemical Safety has implemented EMS mobile in order to allow for real time safety equipment inventory updates. Using this modules Mobile Inspection Wizard, inspection requirements are easily met and monitored. Inspection questionnaires are customizable to fit your inspection, users can input answers during the inspection as well as photograph and document the facility components that need attention. The AIPG (Automatic Procedure Generator), an add-on utility is based on XML and generates an XML description of the procedures chosen by the user. Once called upon the full set of descriptions is loaded to your mobile device where you can then print labels, customize reports and set up email notifications. Based on a preset “To Do List” appropriate personnel and their supervisors receive an email. EMS.Audit is an iPad application that connects to your EMS installation and allows you to perform audits based on user-defined checklists, and upload your answers to your EMS server. One of the most effective functions of this tool is that it can be configured with the EMS Task Management system and initiate automated investigation and corrective action steps by notifying appropriate personnel based on the answers from the audit or inspection. With EMS.Audit you can also view scheduled audits per building on a map and review past responses and actions. The EMS task management system allows you to create and manage projects including cost, personnel, department, and due dates. As well as each task necessary to complete any project. The task management system also assists in monitoring the data for conditions that could indicate a problem or require attention. For example, the EMS can be configured to alert you when waste containers are approaching their limit, unauthorized purchases have been made, or regulatory deadlines. The EMS ad-hoc reporting system provides on-demand custom reporting. It provides self-service integrated reports that customers can customize without extensive database knowledge. From simple to complex reporting the interface is easy to learn and use. While the reporting has great out of the box functionality, it is also easily edited depending on the users needs. A leading manufacturing company in a heavy industry required twice-daily inspections of its production floors for proper waste pickup and also air emissions monitoring results, to ensure that the facility operated within permit limits. The process to-date had been done manually, with paper forms and scheduling delays, as well as monitoring and corrective actions that did not meet corporate standards. Chemical Safety Software was tasked with implementing a software solution that automated the audit, inspection, monitoring and corrective action process for this large manufacturing operation. Chemical Safety configured EMS on a cloud-server, created customized audit and inspection questionnaires that were published on iPads, and customized the input forms to include scanning drums, shop floor locations and stacks to identify the different equipment and processes being inspected. Automated task processes were created to remind operators to perform the audits in a timely manner, and supervisors were notified when delays occurred. The responses to the audits were automatically uploaded and recorded in EMS, and whenever an adverse response was entered, an alert was sent to appropriate personnel for corrective action.